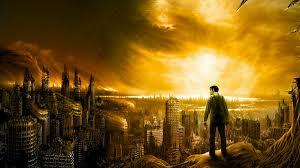 Notes On The Spiritual Life: What is the end of the world? A person was telling me last week about the apocalypse, the end of the world. It was a story full of judgment and punishment that he claims his church taught him. I smiled and listened. I didn't say it but was thinking, "Golly gee, what kind of a God is it that this church is promoting? What kind of a world is this church painting a picture of?" I said to this fellow at the end of his description, "Wow, that's some story." He said, "So, are you saved?" He said, "Good. God bless you." And indeed, I am saved by a God of Love and forgiveness not the gods of vengeance, judgment, condemnation, and punishment. Forgiveness is necessary for churches who teach such nonsense, and their missionaries who promote and spread their misguided teachings about a vengeful, judgmental, condemning, and punishing God who is a projection of this God's believers own guilt, suffering and anguish. With this forgiveness comes a compassion which is not condescending or patronizing, but rather is empathic and understands the pain which contributes to such warped and distorted beliefs. God is Unconditional Love and generates a gratefulness for existence and an extension of peace and joy into the world. The Atonement is when everybody loves everybody all the time and when this occurs the end of time will have come because there will no longer we any need for the world of the ego in which we must learn the lessons of the spirit. We all will become one with all of existence, God.